This is the one I've been waiting to show you all! 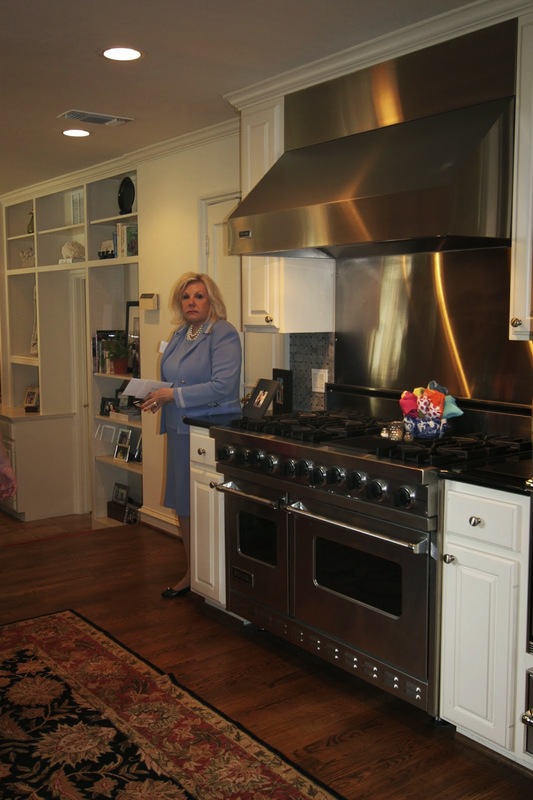 I am so excited to share with you my pictures from the Annual Park Cities Historic and Preservation Society Tour of Homes. 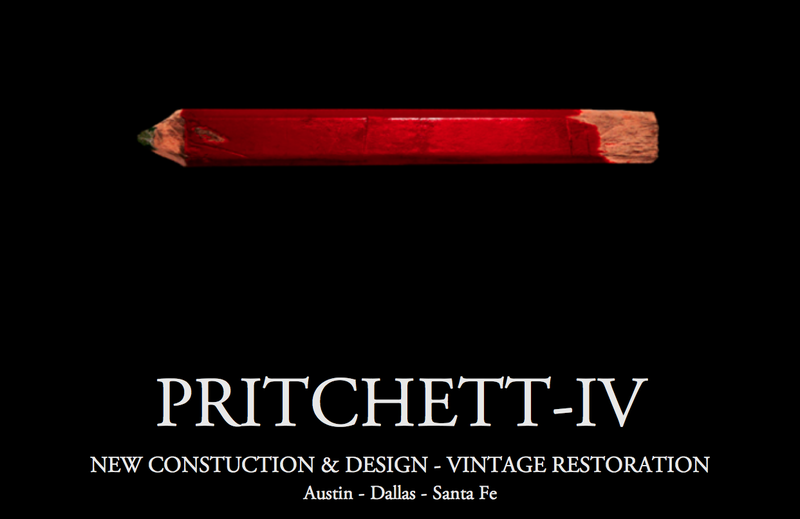 Remember the post I did on Pritchett-IV HERE? 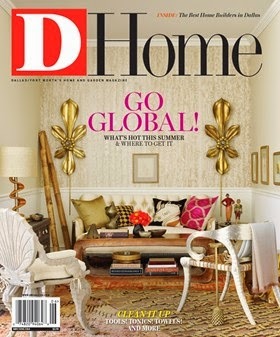 Well, Pritchett-IV was the presenting sponsor of this Tour of Homes and D Home magazine was the media sponsor. 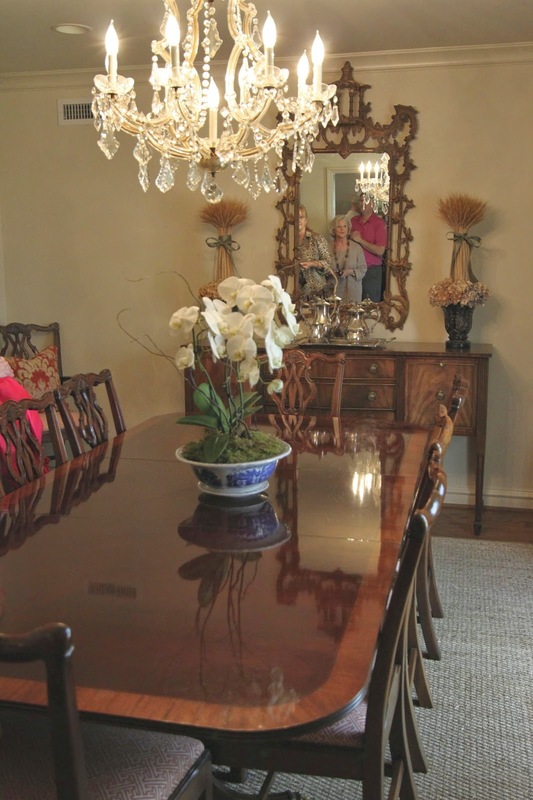 The Park Cities Historic and Preservation Society formed an Advisory Board in 1982 to "bring attention to the loss of irreplaceable examples of architecture and to the importance of preservation of these homes" said Lindalyn Adams a founding member. 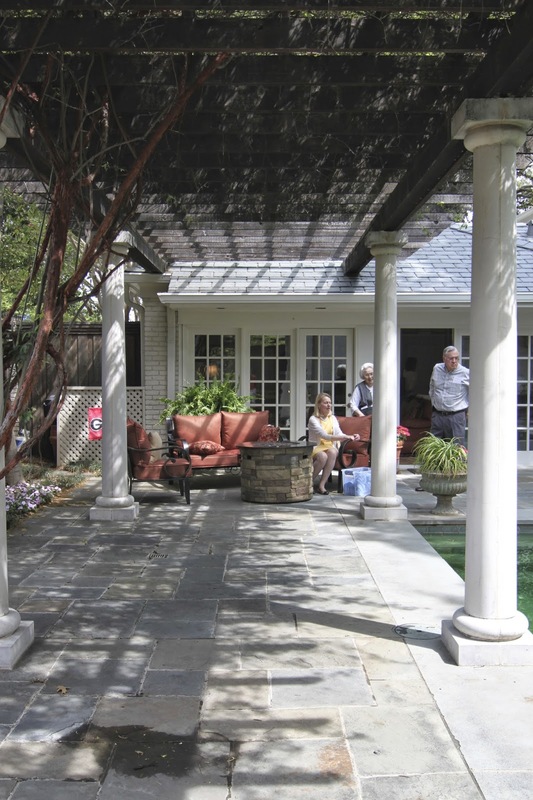 This fabulous Tour of Homes brought lots of attention to great architecture and highlighted outstanding architects as the theme was "Architects of Distinction." There were four different homes to visit with one being the spectacular Harlan Crow house but no photos were allowed so I will show you three of the four one at a time and will show them by order of my experience on the tour. 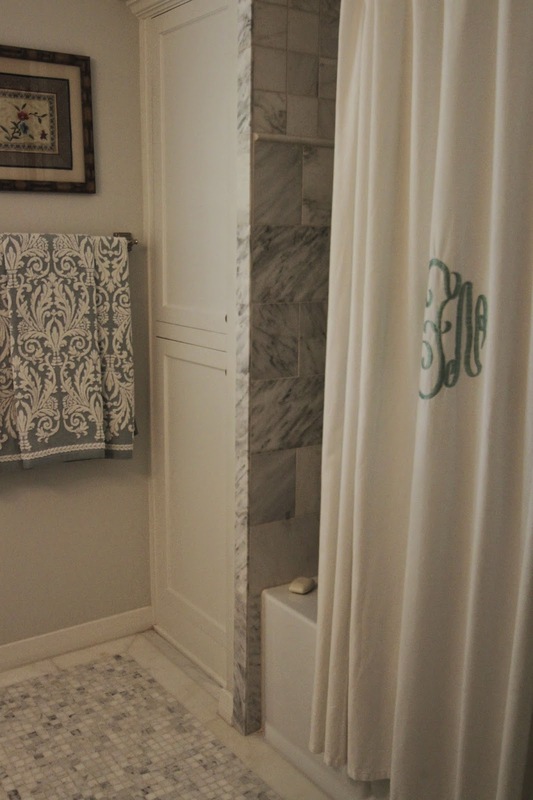 So first up, was this charming French Norman inspired home by Architect Lucius E. O'Bannon. This is the Living Room which was just to the left of the entry. 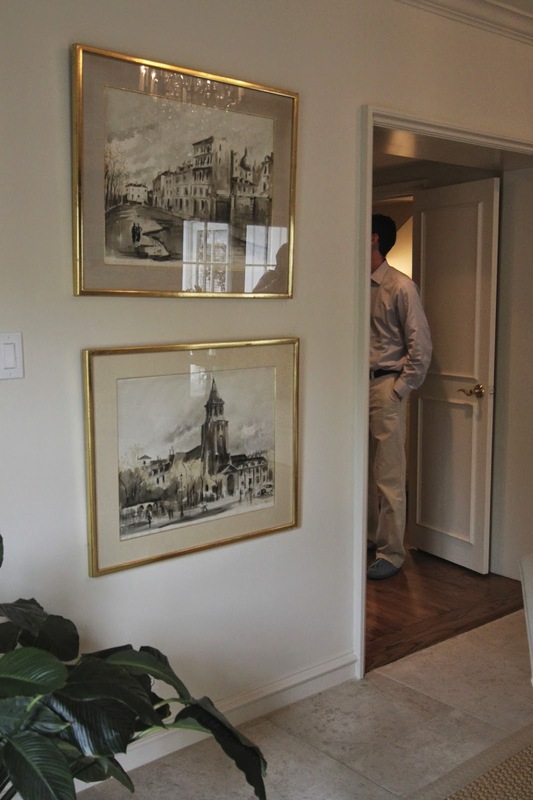 The house had a true center entry with a staircase and the living room was to the left and dining room to the right. I loved all the tongue in groove paneling in here and the original fireplace mantle design. Another shot of the living room. 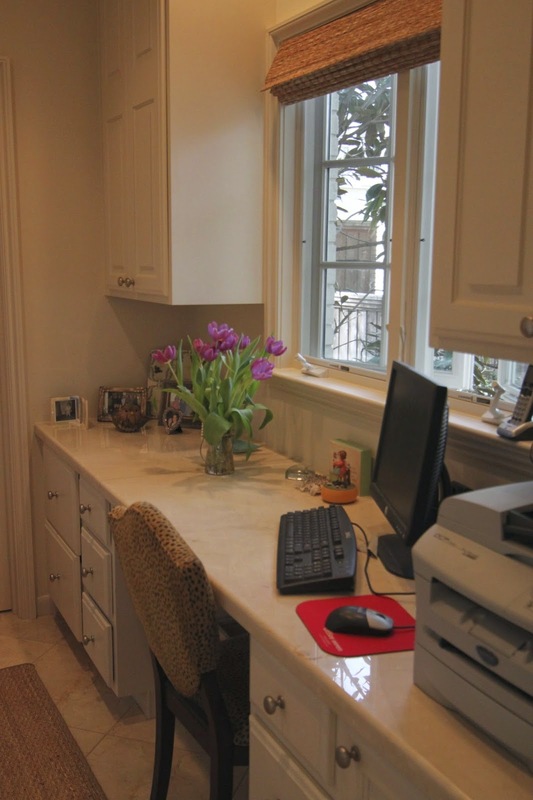 The large windows that went to the floor were another great feature of this space. 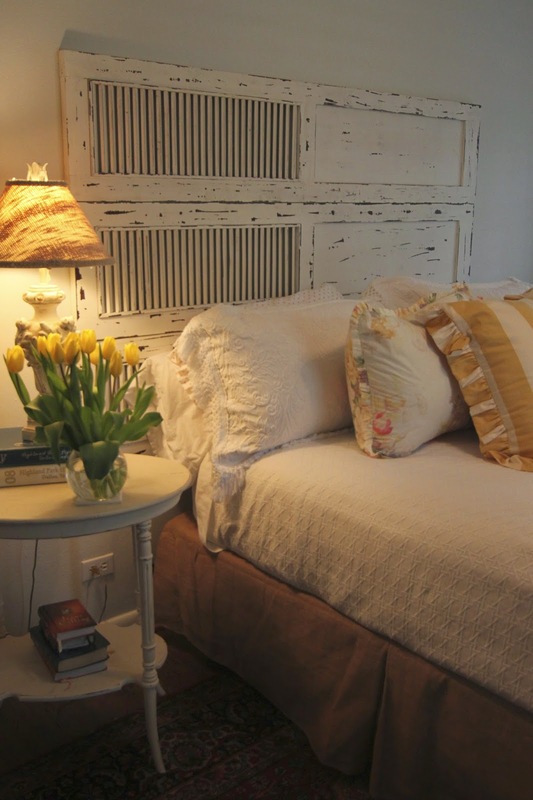 Next we went down a hall into the master bedroom with its french inspired furnishings and partial shabby chic flair hence the clever door hung as a headboard. I loved the french doors that lead you to the outdoor pool. Bamboo shades were another favorite of mine in this room. This room was large enough to have seating and the vaulted ceilings gave the room a very open feeling. 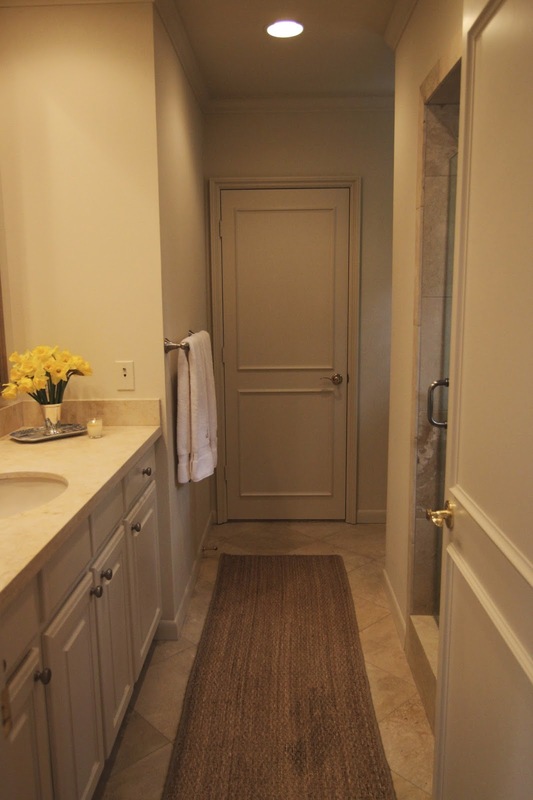 A doorway lead to a private office space that then lead to her bathroom vanity and dressing. This was such a unique idea and I loved the windows once again giving you a view of the outdoor pool and patio. 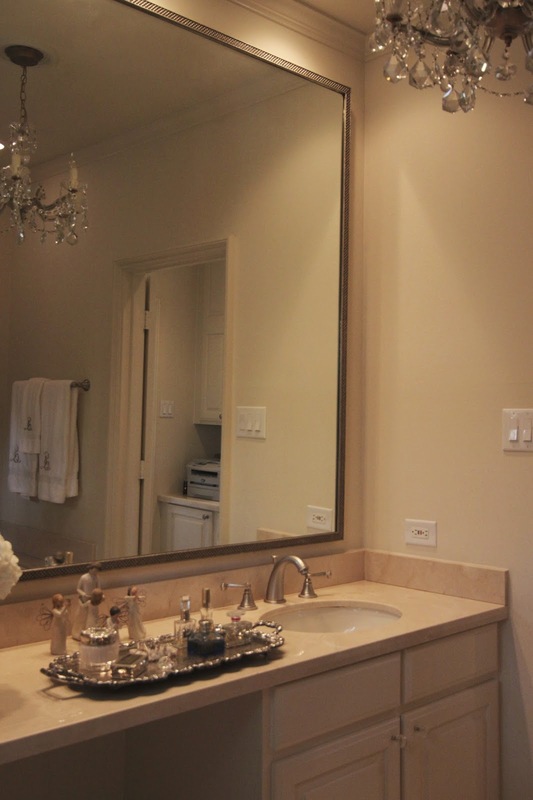 There were separate dressing and vanity areas on either side of the master. 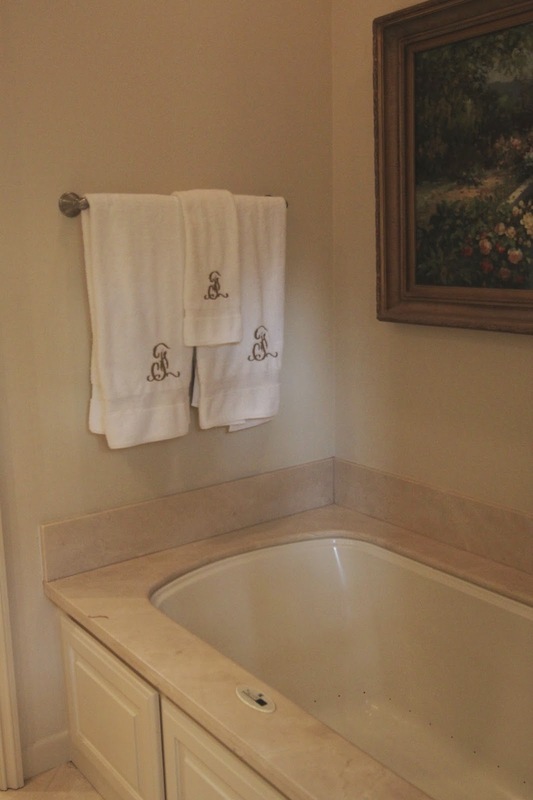 Here is his bath with limestone floors and beautiful stone counter tops. This is her bath with the jetted tub. The monograms on this tour were incredible. I loved the simple "F" in a script. Her vanity with a tray of perfumes and a crystal chandalier. 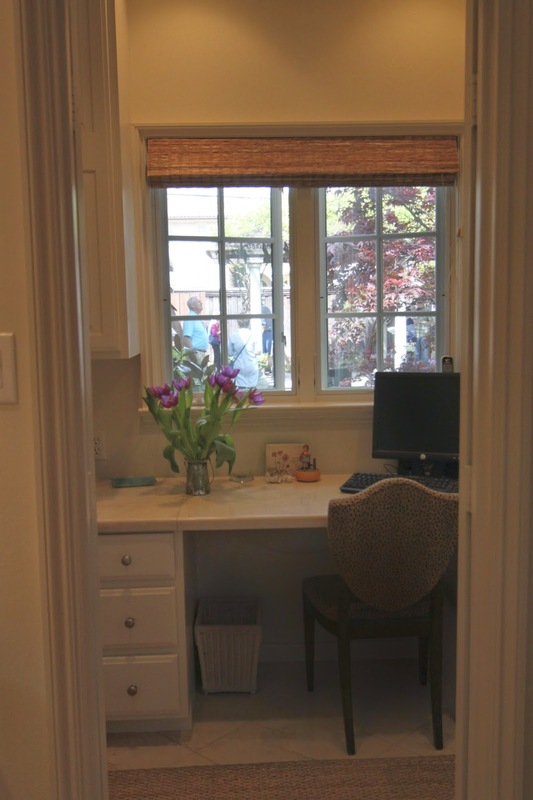 Looking from the bathroom to the private desk space. That darker door on the far left leads to the master so we all exited the master and found ourselves in the family room. 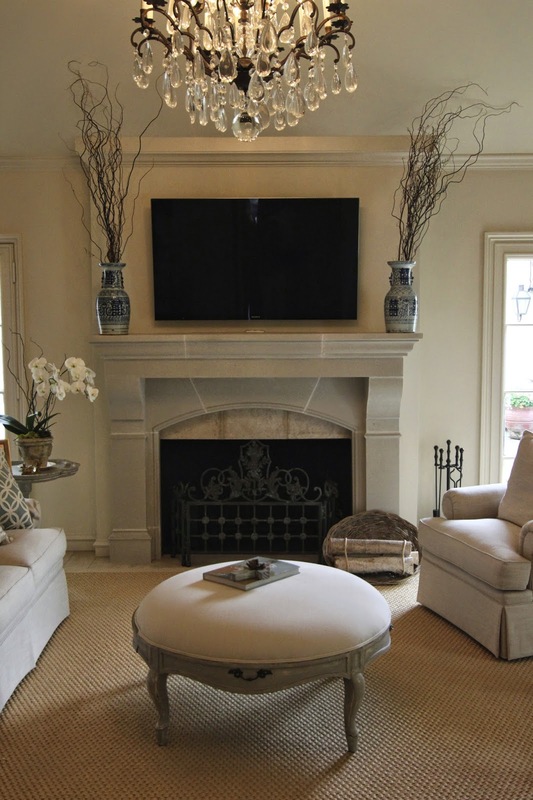 Stone fireplace, vaulted ceilings and neutral furnishings all complimented the house and created a very welcoming space for a larger gathering. 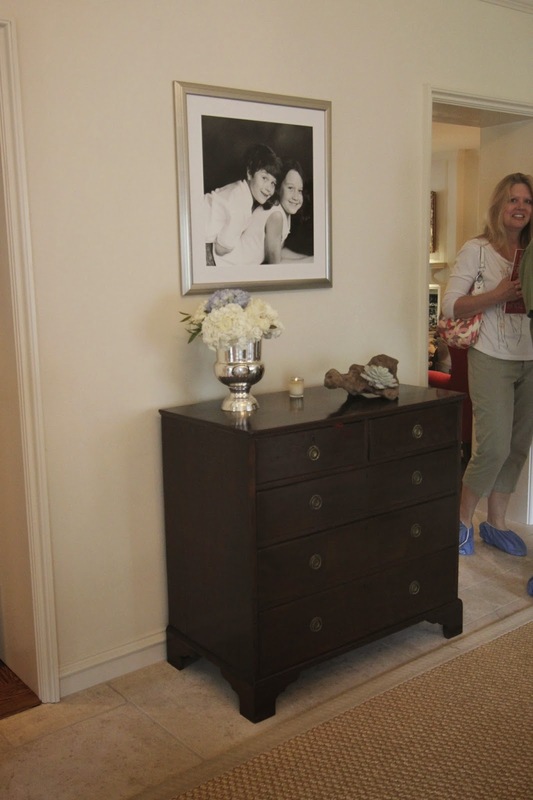 The antique furnishings were lovely in this house and especially like this piece. The wood wrapped in the basket was a great touch. 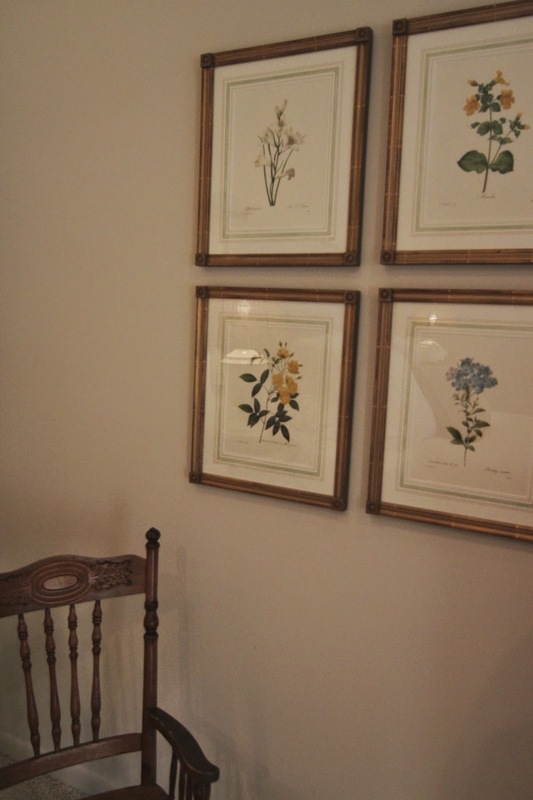 I liked the artwork in the family room. 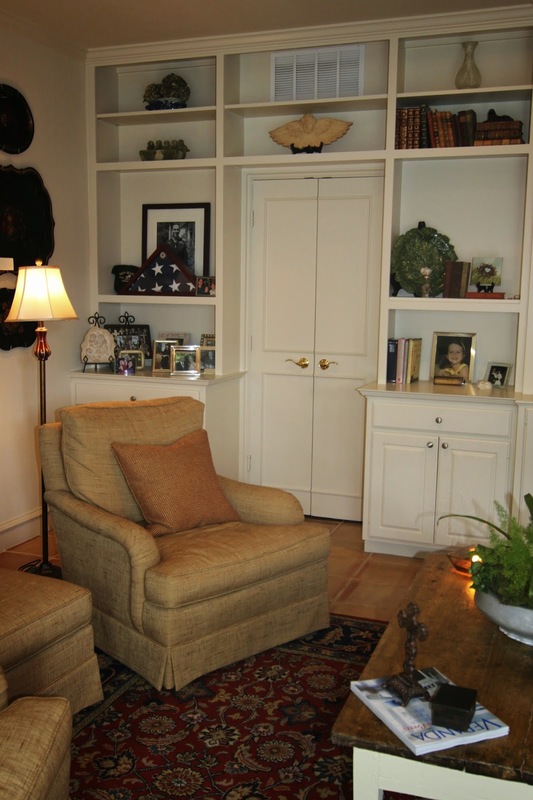 The flanking windows/doors on either side of the fireplace brought in lots of light. You can see a glimpse of the large crystal chandelier. 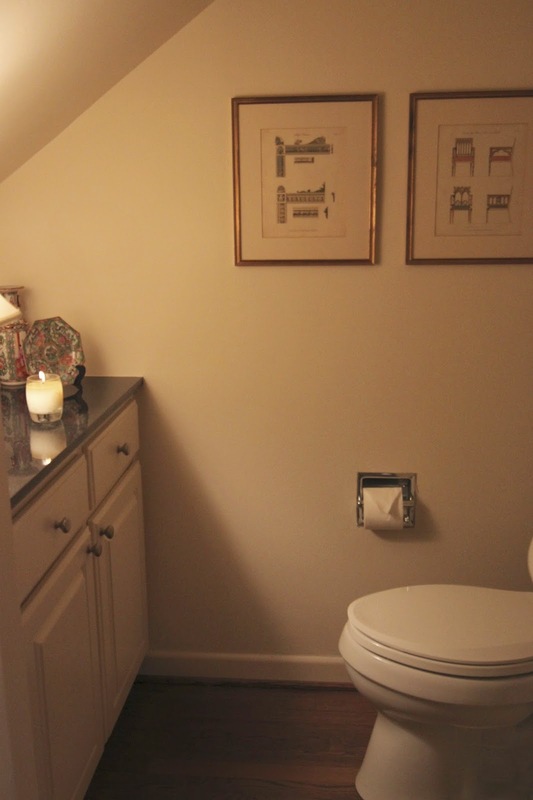 So the entry lead you straight to the family room with this little powder bath found under the staircase. I loved how they took advantage of this space. The Chinese export on display and antique etchings were my favorites of this powder. 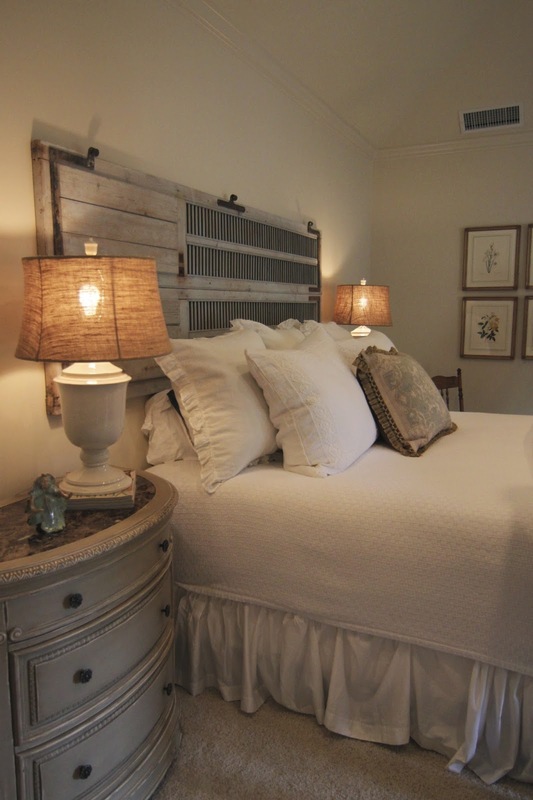 Then we all walked up the stairs and into a guest bedroom with more great windows and shutters. This was the daughter's room with another door used as a headboard. The floral and stripe made this room very cheerful! There were great built-ins in here with a window seat. Perfect for a daughter's room. 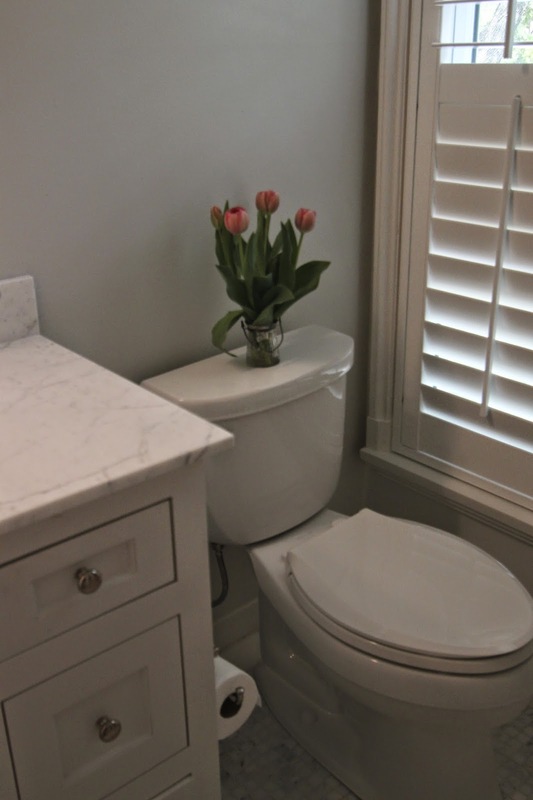 This bath had been recently updated with Carrara marble. Isn't it beautiful. 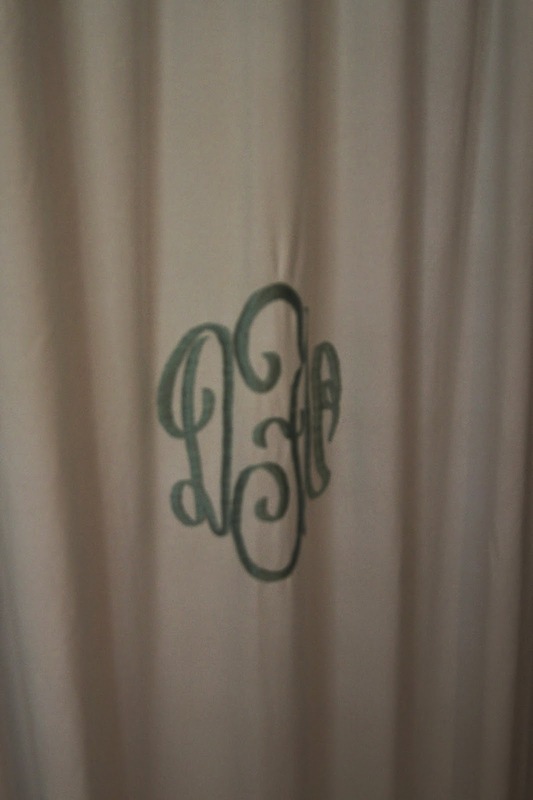 The monogram on the shower curtain was amazing. 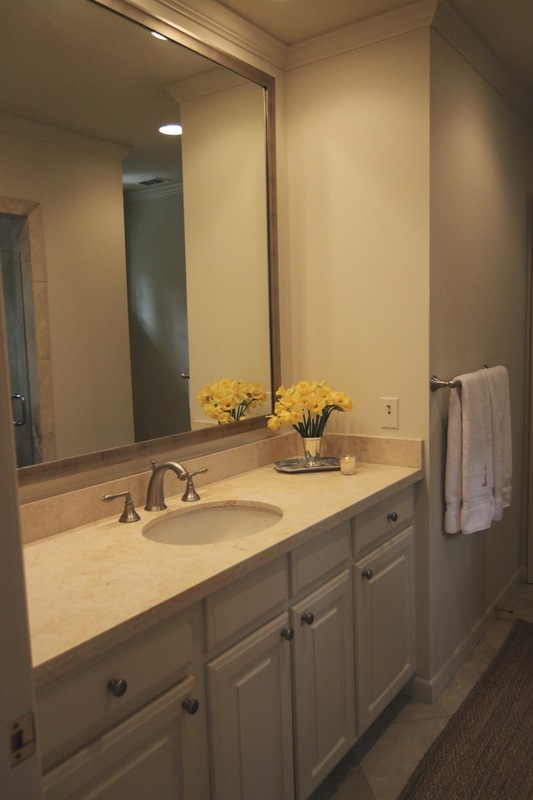 Here is the vanity. 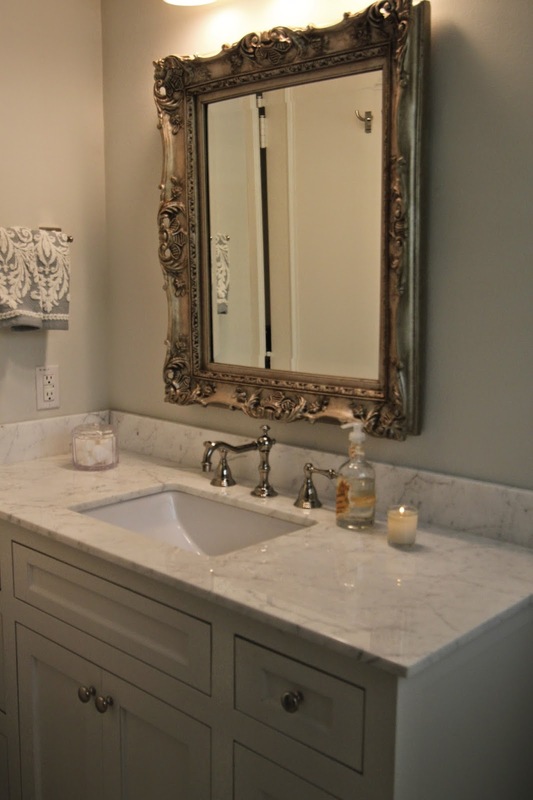 I don't think I can ever get enough of Carrara marble. More shutters and here you can see the inset drawer detail. I much prefer an inset drawer to an overlay. Back down the stairs through the entry we were then lead to the dining room with its wonderful chippendale dining chairs and banded edge dining table. Amazing portrait oil painting of what I'm guessing is their son and look at the beautiful silver tea service. Here's the dining room looking back at the entry. From the dining room we headed into the kitchen with its white cabinets and black granite counter tops and gorgeous Viking appliances. Here you can see the wood floors and the perfect stain color that were found throughout the house. A few steps down and there is a secondary family room that opens from the kitchen. Flanked by lots of french doors this space was very inviting. One wall of the family was full of built-ins. Another shot showing the open concept from the kitchen. 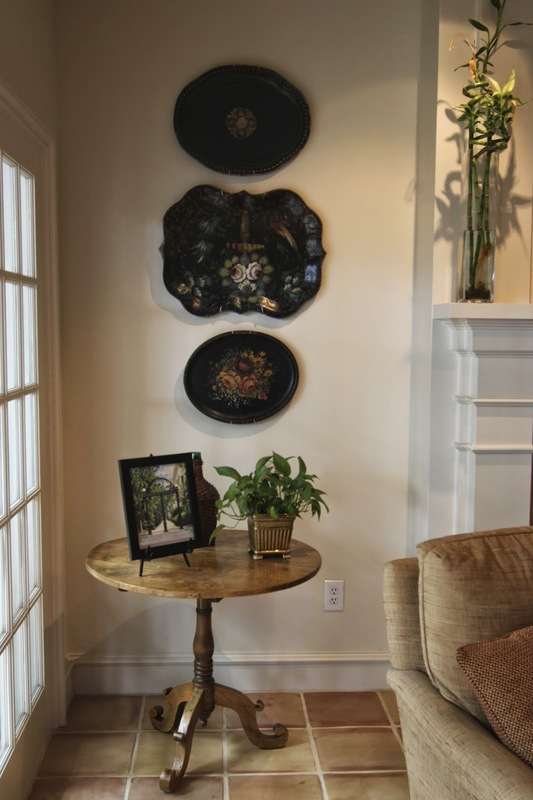 Loved these antique french victorian plates hung as art. This is the backyard and with its pool and pergola. This view looks back to the bank of french doors from the family/kitchen area. Here you can see the windows leading to the more formal family room with the stone fireplace. The fact that the pool was surrounded by the house made it so cozy along with the large trees. Such a beautiful and traditional home. So beautiful, and I am dying over the kitchen!